Ergonomics: Tablets and smartphones literally cause pains in the neck when used for extended periods. They’re harder to use for typing than a desktop with an expansive keyboard. Their displays are smaller than those of typical desktop PCs. Fine cursor control is difficult or impossible on tablets and smartphones. When faced with a choice between mobility and comfort, mobility often wins. But when people don’t need mobility, they usually choose comfort over saving space. Compute Power and Storage: Desktop PCs can accommodate faster, more powerful processors than mobile devices, and can control more peripherals simultaneously. They are almost infinitely expandable. If you need several terabytes of storage in a PC or Mac desktop, it’s not a problem. Tablets and smartphones can’t even come close, in either raw power or storage capability. Which Windows 8 License Do You Need? Laptops and tablets are all nice toys but they pale in comparison to a customized desktop PC. I know exactly what my machine can do and it’s upgradeable. Can’t say the same for the others. Don’t get me wrong, I love my laptop and tablet but if I had to choose, I would go with the desktop PC any day. Absolutely…Give up my 24" Dell monitor in favor of a 3" screen? They must be joking or just plain ignorant. The desktop will be around for many moons to come regardless what the desktop doomsayers say. Now, if they would have said we'd be using our 55" LED TV instead, well…OK, I'd bite. Bigger is better. 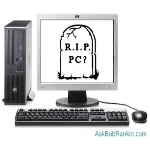 I don’t see PCs dying anytime soon either. I do computer aided drafting using 3D software (SolidWorks). I design large equipment (rough terrain forklifts) and the main assembly files can get rather huge. I just ordered a new Workstation from Dell so I could have enough memory (32GB) to handle these drawing files. I have a 24″ monitor and can’t even begin to imagine using a tablet or even a 17″ laptop. For most people, the tablet may be just fine, but there are still areas where a good PC is the only way to go. I am totally agreeing with your views, however there is a trend for many users to switch to a 17″ screen laptop allmost as fast as a desktop, or a 15″ one connecting it to an external (monitor of 19″ or 24″) as well as an external HDD for plenty of storage. Likewise they combine both mobility and comfort especially if they are going to use a mouse for fine cursor control. But I am for sure against tablets and smartphones which can be used only as auxiliary devices when you are on the move. So I guess there will continue to exist a demand for both kind of devices.